Ok I fell way behind on #caricatureresolution2017. In my defense it's Chinese New Year here in Hong Kong plus we've been setting up the studio .. so a lot of distractions. Actually I've made starts on most of them and a number of them are almost done so I'll try to finish them off and post. 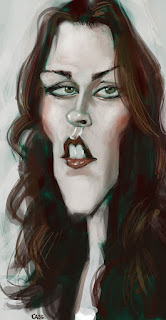 That said, here's Kristen Stewart.